Financial services companies need to establish trust with their clients. This often starts with the first visit to the firm’s website. Our Toronto web designers have the experience to make a lasting impression. Parachute Design has practised professional website design for financial service companies in Toronto since 2003. Over the years our team of web designers and web developers have carefully honed their skills in and understanding of web design for financial institutions. All financial brands have a unique identity and personality that should ultimately guide the web design and marketing initiatives, but there are a set of crucial guidelines that our Toronto web design company follows when approaching a new website design for a financial services company. 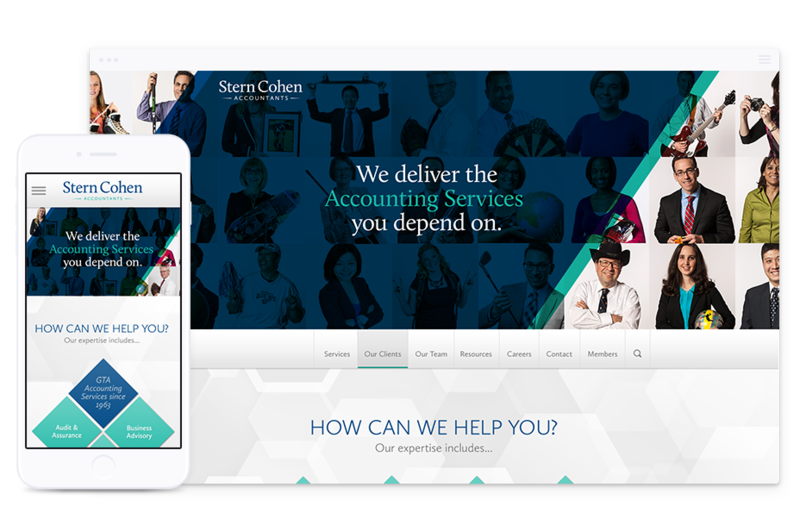 To take a guided tour of our latest financial services company website design, please take a few moments to read our Stern Cohen case study. Fully responsive web design is an absolute must-have for all financial service websites. For an investment firm, accounting firm or bank to fully engage its web users, the website must be mobile friendly and responsive to all contemporary devices. A financial company must be able to communicate directly and efficiently with all users across the desktop and mobile spectrum to enjoy a successful marketing campaign. Website design for financial institutions should be content driven and offer clear and direct information to web users. Financial company website design most often takes the less is more approach and relies on a more straightforward website design that guarantees web content and financial information remains the focal point. Quite often, when undertaking website design for financial service companies, our web designers rely on subtle and strategic calls to action to engage users at the right moment in their conversion journey and help leads become clients. As the website user interface design is often simpler than most industries, maintaining a reasonable balance between the web content, design elements and visual calls to action is crucial to achieving a high conversion level. Financial service companies are often stereotyped as being bland and unimaginative. Planning a digital marketing campaign around this stereotype can be hugely successful. Along with a strong social media presence, the most critical piece in a digital marketing campaign is a financial company’s website. The website is the home stretch and where the most effort should be devoted to creating an entirely branded user experience. A financial service company website design that stands out and showcases unique personality will rise head and shoulders above the competition and command attention and market share. Throughout our years of experience creating website design for financial service companies in Toronto, we have had unrestricted access to website analytics data for banks, credit unions and investment firms. Using this opportunity to deliver successful website designs and further, our research and understanding of how users interact with financial services website design have allowed us valuable insight into the user behaviour and trends within the financial industry. All financial services websites have a universal need. That need is emphasis on providing customer service. As a web designer, our goal is to provide quick and easy access to digital customer support whether it be contact information or live chat. Creating a highly optimized financial services company website design that offers a great user experience is paramount. If you’re a bank in Canada, you’re competing for marketing share against giants that rule the industry. If you’re a credit union or investment firm, you’re standing amongst thousands of other financial service companies all screaming for attention. Search engine optimization and ranking are critical to surviving. Engaging a professional and experienced website design company can ensure that your website is fully optimized for search and able to compete in organic search out of the gates. To learn more about Parachute Design and our approach to web design for financial companies you can reach our Toronto web designers by calling 416-901-8633. If you would like to have us prepare a formal proposal for your financial services company we invite you to complete our web design quote request form. Need a Web Design Quote for Your Financial Services Firm? Starting a financial services website design or brand refresh? Our Toronto web design company can plan and execute your project to ensure winning results.